Last night was our first night in the fiver. We had a great and relaxing evening. We were both tired, so we didn’t stay up too late. The cats settled in pretty well, except they were restless over night. We were awakened several times throughout the night when they decided to join us for awhile. We were really pleased with the heat retention. We left the heat on 60 degrees and were perfectly comfortable under our nice down comforter. Harry got up in the middle of the night and checked the temperature. It was 27 degrees outside. We were both surprised since we were so comfortable. So I guess we don’t have to worry about what it will be like in the fiver this year during the late fall. This morning we had our first Sunday morning breakfast in our new home. What a great feeling! We can almost forget that the “stix n bricks” are only a few feet away. I’m not sure if it feels real yet. Maybe it will when we are heading out for our first road trip, or when we get that “for sale” sign in the front yard. We both got back to work this morning. Harry wanted to install the Pressure Pro system on the truck tires. He still has the fiver tires yet to do, but that is on the agenda before we head out in three weeks. My project was to start working in the house. I am going to do one room at a time. The living room was first on my list. Here is the result after a couple hours of work. For the most part, it’s all set – have some dusting, sweeping etc. yet to do, but all of the pictures and personal items have been removed. After months of planning and arranging, today was the day! MOVE IN DAY! We are now settled in the fiver for our first evening, and tonight will be our first night sleeping in here. I worked this morning, and after I got home, I got busy bringing over those last minute items. It’s been a bit of a challenge over the last weeks with some of our stuff in the house and some in the fiver. So, today was the day to bring over things that we use all the time, like our computers, coffee pot, things like that. I also had to bring in everything I needed for the cats. I wasn’t sure how much time it would take for them to adapt, but they settled right in. It helps to have the cat tree and all of their familiar items in here. We are now in the fiver for good. There are several reasons that we made the decision to move out now. One reason is that we have three weeks left until we start our summer travels. We only have from 2 to 4 weeks between our trips. 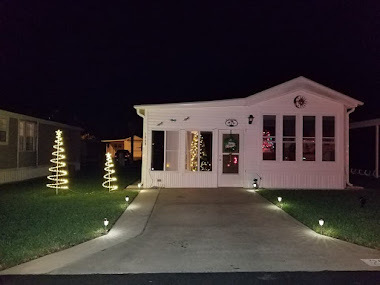 We didn’t like the thought of moving stuff back and forth between the house and rv before and after each of our trips. Another big reason is that we are ready to start putting the finishing touches on our house sale preparations. Now that we are out in the fiver, we can empty out all of the cat stuff and all of the other miscellaneous odds and ends. And the final reason is simply – we’re ready!!! Over the past few days, I have been doing more organizing over in the fiver. I’m really happy with how things are looking. I also like the fact that the table has some storage areas. Harry brought over our wireless printer a few days ago. It fits perfectly on the shelf. Today I started bringing over more kitchen items. I also bought some shelf extenders to maximize our space. We can fit so much in our pantry! This is just about everything that we have to bring over. And I still have some shelf space left. We are down about five inches for the year, so even though it’s the weekend, we are glad that it is raining. Our leaves have been coming out very gradually, due to the mostly cool temperatures we have been having over the past weeks. There was some time yesterday morning while I was at work when it was beautiful out, and Harry spent some time doing an inventory of the front compartment. We’ve already had the experience of looking through multiple containers before we find the one item we are seeking. The basement is next! The junk pile is dwindling slowly. I have already filled the bin for next week’s pickup with as much as I could get into it. Harry has been organizing his work bench, cleaning out and pitching. So another great weekend! And now only 4 weeks left until our first road trip!! Last fall, we looked at what we had left to accomplish on the house, and we decided that we would try to get as much done as possible during the winter months so that we wouldn’t have to work all summer – we hope anyway – that was the plan! We had a pretty long list. One month from today, on May 19th, we will be heading out for our first road trip of the year. So I thought today would be a good day to take inventory of our progress. Wow, one good thing about a blog is that you can look back and see exactly what happened in a certain month or period of time. Until I looked back while I was getting ready to write this entry, I really had forgotten how much we had to do as of last September. In the last six months, we’ve replaced the upstairs bathroom floor, vanity, etc., painted the downstairs bedroom and office, replaced the downstairs bathroom floor, cleaned out the basement and the garage storage area. We’ve also cleaned out various closets and piles of STUFF that were sitting throughout the house and gotten rid of a lot of it, through freecycle and giving stuff to family. Phew! I feel really good about everything we’ve gotten accomplished over the past few months. The garage remains as the last area that we still have to work on, although we have made some progress here as well. On March 21st, I took these pictures of piles that needed to be disposed of in our garbage pickups. This was the upstairs storage area after we had started cleaning it out. The garage is still an area in progress…but the big piles shown in the “before” pictures are all gone. The upstairs storage area is almost done! We are still in the process of moving our stuff into the fiver. We have continued to weigh everything that we bring in, and have also weighed items like our computers, tray tables, crockpot - things that for now are still in the house but we know we’re bringing them. We are about 400 pounds from the amount of weight that we have allotted ourselves. So we are at the point of being more discerning. Luckily, we are also at the point where we don’t think there’s much left that we want to bring in. So far we have A LOT of storage space left. Like Harry says, we have more space than we do weight to allow us to fill those spaces up. We almost have more of our things in the fiver now than we do in the house. Our plan is to move in over the last weekend of April. We want to be in and settled before our first road trip in May… …which is now only 30 days away! These weekends are, that is! I knew this one would, because we had company, and I was right. Schaun had fun playing in “camp driveway” while Harry worked on sanitizing the fresh water tank and water lines. This past week was Schaun’s 3rd birthday, so we had a little celebration, and Schaun opened his presents. This afternoon we worked on putting up some wall decorations in the fiver, and moving in a few more items to put away. I also put shelf liner on all the kitchen shelves and drawers. We had an afternoon shower, and were happy to see some badly needed rain. Our April showers have been pretty lacking so far this year. We are now done working for the day. Time to hang out, watch a little tv…and for dinner, homemade pizza with grilled veggies. Yum. Only 33 days left! YAY!! The days are zippin’ right along!!! It’s been one of those weeks when there’s not too much going on. Other than the usual go to work, come home, eat dinner, etc. repeat cycle that we seem to get into every work week. We have been cooking on the barbeque several times a week, so that has been great. I have been experimenting with making some new bbq sauces. Yum! Today is garbage day, so we have another two bins of recycling and garbage being picked up. By this weekend, we may be able to take a couple pictures and show the progress in getting that garage cleaned out. We now have only five more work weeks until our first road trip. That is only 27 more WORK days. Do I sound like I’m counting? Yup, I am. We both are, as it has been over six months now since we last took any time off from work, and we are ready for a break. We have been saving our vacation time for the nice weather months, and are happy that they are almost here. We have company coming this weekend, as Harry will be heading to MA to pick up Schaun tomorrow. So we have another fast and busy weekend coming up. Happy Easter! I hope everyone had a wonderful weekend in celebration of Easter and Spring! We had another busy weekend around here. We didn’t really take too much time off from working on our projects, as we now have only 6 weeks before our trips begin, and our goal is to finish as much as possible before then. Although, we did go over into the fiver for a couple hours later yesterday afternoon, and just enjoyed hanging out for a little bit. We brought the cats over, and they seemed to remember it from last September. They also checked out the new litter box and both gave it the, a-hem, stamp of approval. So…what did we get done this weekend? Well, Harry took an old water heater and eight big bags of garbage to the transfer station. He also did some touch up painting in the guest room and in the kitchen where we had replaced the ceiling light. AND, he spread the bags of mulch that we bought last week. After I got home from work, we took down the canopy frame on the back deck. The deck looks so much huger now! And we cleaned the front door, which was looking pretty dreary. That was enough for one day, so we headed to the fiver to relax for a while. We both are so ready for the days when our house projects are at an end and we can enjoy our new home. It’s a wonder we have anything left in this house! After we got home this afternoon, Harry dewinterized the fiver. YAY! We are FORTY days from our first trip of the season.